They’re not the words you want a 12-year old to howl in distress at this time of year. After all, ‘tis the season to be jolly and a magical time for kids. There’s an excited energy, we break up the routine, new sights and sounds are everywhere and there are surprises galore. What’s not to like? Except that for some – children and adults alike – it’s a list of everything that makes them highly anxious, confused and fearful; the absence of predictability and the presence of unfamiliar environments. Responding to sensory overload, those words “I’m frightened of Christmas” came from a distraught pupil at the special needs school my son attends this week. The noises, the lights and the changes in routine had proved too much. Thankfully, their episode didn’t last long. After a short while in a quiet room they were soon back in class, joining in again as if nothing had happened. Such is their world. But it is a reminder that people see the world, and interact with it, in very different ways. We can learn a lot from them when we’re designing and improving customer experiences. While many organisations chase the “Wow!” moments, there is a significant element of the population – nearly one in every four of us suffers a mental health problem – for whom less is more. If we designed experiences or provided alternatives for those most affected it stretches the thinking so we get it right for everyone else too. We all want pretty much the same things – we want things to work as promised, we need them to be easy and if they create the right memories we’ll do it again. For someone with a disability, having that reliability and consistency is essential. The consequences of not having them can be significant. It’s not just a nuisance or a niggle if a product or service doesn’t work; it can be outright distressing at best. 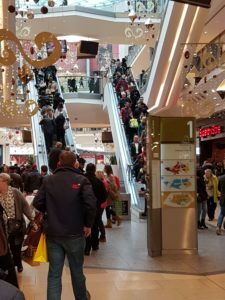 To take a journey into a retail park or through an airport might take weeks or months of preparation for the person affected and the people around them. For them it’s like walking on ice and it doesn’t take much for everything to fracture and turn into disarray. It can be simple things that tip the balance – a schedule change, hand-driers in the toilets that are deafening or shouty officials trying to rush everyone through. If we evoke fear and panic in someone, the implications for whether they’ll come back again are clear. Especially for someone with autism where emotions can be amplified, having their expectations managed – and kept to – is key. It doesn’t matter if it’s about the day’s timetable or going on a holiday, knowing what’s going to happen gives structure, boundaries and therefore security. So if there’s a tipping point as the experience gets worse, beyond which customers simply won’t come back, that fulcrum is a lot closer for people with a disability. Experiences that don’t work properly for them feel like their world is in freefall. They feel they have no safety or security and it’s a scary, lonely place. Families and carers with them will do their best to manage the situation but if we assumed everyone would feel the same way, we’d create much more robust and consistent experiences for everyone. We focus on designing experiences to be emotional ones wherever possible. And that is absolutely the right thing to do for reasons that are well-documented. But it’s critical to evoke the right emotions. Sometimes, the worst thing we can do for people is ‘surprise and delight’ them. What might work best to keep them coming back is simply an environment where things are calm, friendly and steady. For example, I’ve researched what passengers say to each other about what makes the ‘best’ airports in the world. They are quiet, clean, friendly, quick and easy to navigate. Nothing complicated. It’s why therapy dogs (and pigs) at airports work so well. The principles can apply to any company in any sector so it’s why film screenings where the sound is turned down, the lights are up and there’s no advertising to wade through are so popular. And it’s why restaurants who give the option to send information before a booking about how the dining ‘experience’ works, show pictures of the food and provide safe ‘time-out’ spaces are creating personal and commercial benefits all round. Evoking the right emotions in our experiences meaning we know which ones they are for different groups of customers, understanding why that is and how to make sure they are present every time. If we see things the way people with a physical or invisible disability do, it forces us to expand the thinking about our experiences in a different, more robust and better way. And that is something companies should embrace, not fear. I hope your Christmas and the festive break is everything you want it to be. Thank you for reading this blog about people with a disability and customer experiences. I hope you found it useful and thought-provoking. I’m Jerry Angrave, a Certified Customer Experience Professional (CCXP). I’m a CX consultant with an extensive corporate background and I also specialise in professional development for those in, or moving to, customer experience roles. Feel free to contact me with any questions – by email to [email protected] or by phone on +44 (0)7917 718072. More details at the website www.empathyce.com.